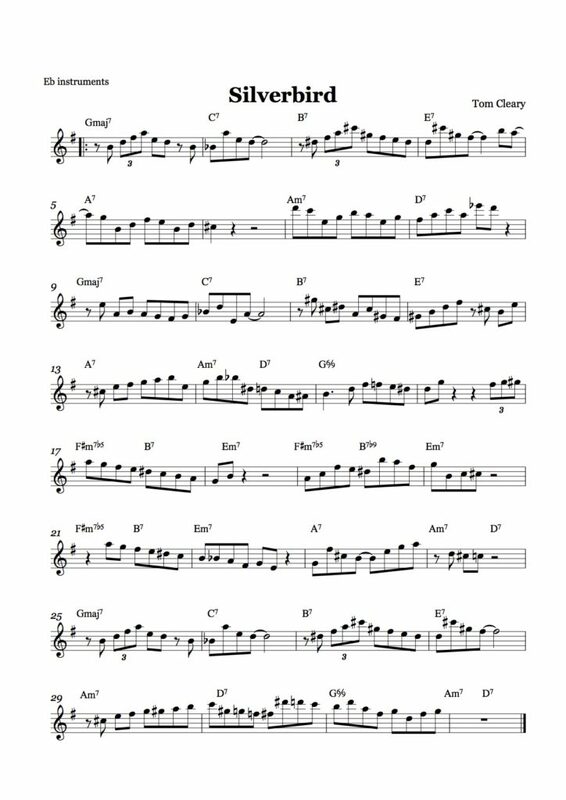 ‘Silverbird’ is a melody line I composed on the chord progression of the jazz standard ‘There Is No Greater Love’. 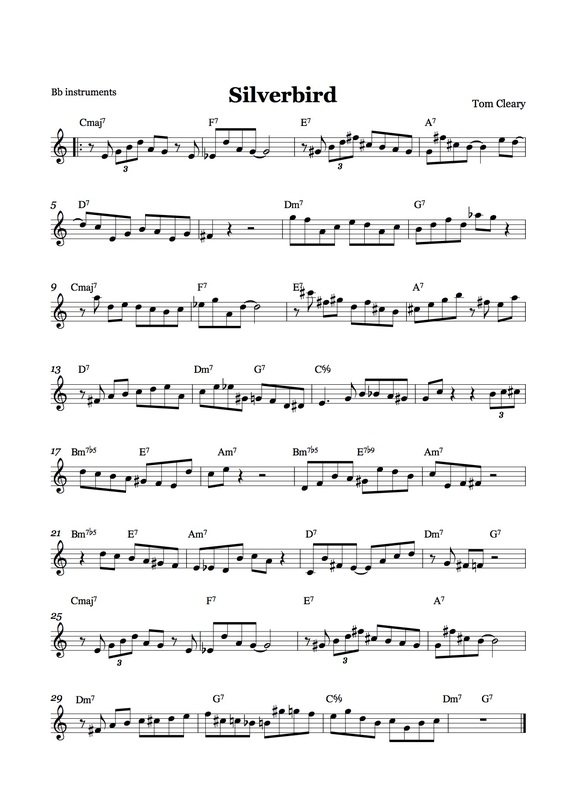 This line is meant to demonstrate key aspects of the bebop melodic style, including its balance of arpeggiation and step motion, its eighth-note-based, upbeat-oriented rhythms and its use of chromaticism. The title alludes to my sources of inspiration for the tune, which are the melodic languages of pianist Horace Silver and alto saxophonist Charlie Parker (whose most common nickname was ‘Bird’.) (As it turns out, there is a bird species native to Eastern Africa called Silverbird as well.) 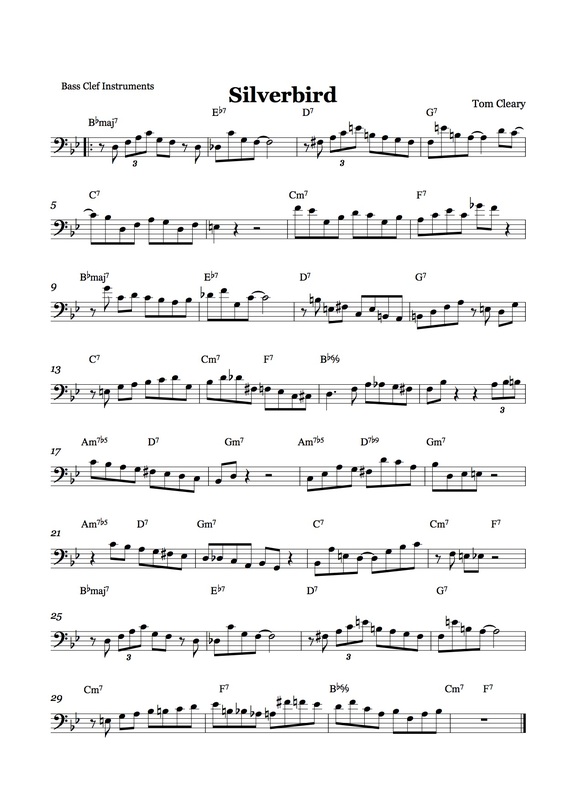 The tune is intended to help aspiring players incorporate bebop concepts into their improvising. A solo piano recording that I made of the tune can be heard here. Charts for my tune in all standard transpositions are below. (For the second note in m. 17, I recommend going with the concert D in the chart rather than the concert G on the recording.) Before learning a complex line such as ‘Silverbird’ based on a standard progression, I always ask students to learn the tune’s original melody and chord changes. One source for the melody and changes of ‘There Is No Greater Love’ is the Jamey Aebersold collection Jam Session, where it is referred to on the cover as simply ‘No Greater Love’. (Students who are preparing this tune for the Vermont All-State Jazz Ensemble auditions are required to bring an original copy of this Aebersold book to the audition.) I also usually ask students to learn a basic scale outline of the chord progression; here’s a link to my latest scale outline of ‘There Is No Greater Love’. My recording of the outline demonstrates a conversational approach on the piano to integrating left hand chords and right hand scales, but single-line instruments can also learn the right-hand line alone. 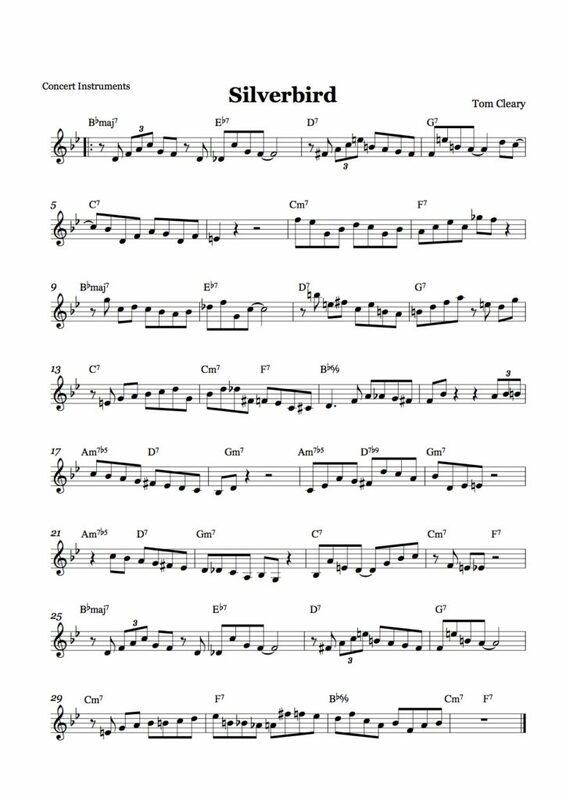 There are also differences between how each of the three ‘A’ sections of the AABA form are outlined, as distinguishing between these sections is one of the challenges of improvising over this type of form. The bass and drum accompaniment continues for a number of choruses after the scale outline, which can be used to practice improvising. It is well known that many bebop tunes re-use chord progressions of popular songs and replace their melodies with more rhythmically active lines. My study of the influential bop tunes written by the trumpeter and composer Benny Harris, as well as Douglass Parker’s article on ‘Donna Lee and the Ironies of Bebop’ (from the collection ‘The Bebop Revolution in Words and Music’), have made me aware that bop tunes were often melodic crazy quilts in which aspiring improvisers took phrases they had learned from players and practiced using these fragments to create a coherent melodic story of their own. This is what led me to base my melodic line on aspects of Silver’s and Parker’s melodic style. Pianist and composer Fred Hersch mentions in his recent memoir Good Things Happen Slowly that listening to multiple versions of a song by various master jazz players can help one develop a sense of the song’s possibilities as an improvisational vehicle. When I worked on ‘There Is No Greater Love’ recently with a combo at Vermont Jazz Camp, we listened to versions of the tune by Chet Baker, Sarah Vaughan and Miles Davis. These three versions suggest the universe of possibilities which jazz players can find within a seemingly simple tune. Baker sings the tune at a ballad tempo, adding slight diatonic ornaments and more radical rhythmic adjustments to the original melody. On his version of ‘There Is No Greater Love’ from the album ‘Four and More’, Miles Davis takes the tune at a much faster tempo and regards the original melody with his trademark sense of detachment, departing more radically from the melody line than Baker does (starting at the fifth measure) and in other places leaving significant chunks of the melody unplayed (such as the third and fourth bars of the bridge.) Miles’ interpretation of the melody questions the traditional hierarchy that places a soloist in the foreground and accompanists in the background, and shifts the focus toward the unique group interaction that was occurring in Miles’ ‘Second Quintet’, which featured the adventurous young rhythm section of Herbie Hancock on piano, Ron Carter on bass and Tony Williams on drums. Sarah Vaughan’s version from ‘Live In Japan Vol. 2’ uses the tune as a virtuosic display of her skills at improvising and interacting with her trio, dispensing with lyrics and soloing first with bass and voice only, then drums and voice only, then with piano and voice only before bringing in the whole group. I hope that listening to these great versions, learning the original melody and changes to ‘There Is No Greater Love’ and practicing ‘Silverbird’ will give you some ideas of your own about how you’d like to interpret the melody of this great standard and improvise on its chord progression. I encourage you to share any thoughts in the comment section, particularly about practicing ‘There Is No Greater Love’ and/or ‘Silverbird’, or about other versions of ‘There Is No Greater Love’ that you find particularly original, unusual or inspirational. Hi Nat, Thanks so much for sending the recording. I’m so glad you and your group took my tune ‘Silverbird’ and ran with it! Your group sounds great; I particularly like ‘No Greater Love’ on bass and ‘Silverbird’ on tenor for the head in, and your variations on the melody for the head out. It’s interesting to consider whether these contrapuntal discoveries were intentional or not. They might be a coincidence of dedicated study and the similar jazz harmonic palette, although I wouldn’t put it past Miles and Benny to have such foresight. It is exciting to hear the different interpretations of the same song. Chet and Sarah’s versions of “There is No Greater Love” have distinctly unique energies; they are hardly recognizable as the same tune. It will be fun to experiment with our interpretations of our ensemble’s repertoire as we rehearse more together. I’m really fascinated by the idea of re-using chord progressions because in my own songwriting, I often feel like I need to come up with original ideas—I’m scared to accidentally copy someone else’s song or pattern. As long as credit is given where credit is due, though, I think it’s a really cool concept! Perhaps I will try to do that with my own songwriting.